The Bhakti Movement played a crucial role in the literary development of several Indian vernacular languages. It caught the public imagination, especially in the popularisation of Sikhism, as it used music and dance – both simple, intuitive and inclusive forms of expression. However, the Bhakti Movement originated in the South around the 8th Century, in parts of Tamil Nadu and Kerala, and gradually spread northwards. In its original form, the movement emphasised a single-minded, intense devotion to God. 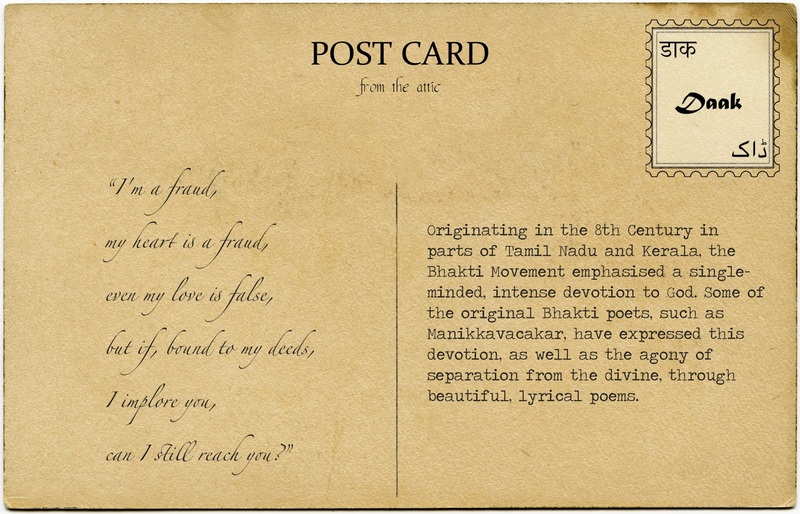 Some of the original Bhakti poets or saints have expressed this devotion, as well as the agony of separation from the divine, through beautiful, lyrical poems. One such saint from the 9th Century, Manikkavacakar, was born in a Brahmin household in Madurai and summoned to court to serve as a minister. However, he longed to renounce the world from the day he became Lord Shiva’s disciple. Although translated from Tamil, his poetry still paints an agonising life which, to him, is akin to death. What is most interesting is no matter how intense the pain, Manikkavacakar’s God remains blameless; he blames his own wretched, physical self which cannot yet comprehend and internalise the divine.